The GOES-17 satellite carries technology that could help us predict extreme weather. The National Oceanic and Atmospheric Administration (NOAA)’s new satellite that is launching from Cape Canaveral on March 1, 2018 could help scientists to get a better handle on the wild ways climate change is changing our weather. If the newest Geostationary Operational Environment Satellite, or GOES-S, makes it safely to orbit, it will be one of the most advanced forecasting satellites ever be placed in the atmosphere and dubbed GOES-17. That’s especially good news given that extreme weather doesn’t always follow pre-climate change rules these days, making it increasingly hard to predict. GOES-17 and its predecessor GOES-16, launched in November 2016, will work together to monitor a region spanning from the western coast of Africa to the eastern shore of New Zealand. Their broad gazes will encompass much of the Atlantic and Pacific Oceans and all of the continental United States in between. GOES-17 will also have a suite of powerful instruments on board for monitoring weather systems, like the Advanced Baseline Imager, a camera capable of rapidly producing high-resolution images in the visible, infrared, and near-infrared spectra. 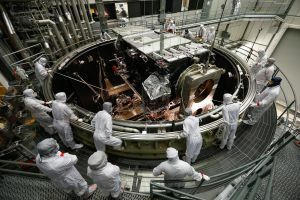 This represents a necessary upgrade to NOAA’s current weather satellites’ repertoire; The Verge reports older satellites are still carrying 1990s-era imaging technology. The new satellite will also carry a system that tracks violent lightning storms — which can be used to predict tornadoes — as well as new instruments that can detect potentially disruptive solar storms and dangerous fog around airports, helping pilots better plan their routes. Climate models continue to suggest that higher carbon dioxide levels and a warmer atmosphere is making all sorts of extreme weather both more common and more intense, from unusually hot and wet days to hurricanes and other storms. It comes as little surprise, then, that the World Economic Forum sees extreme weather as one of the biggest environmental risks for humanity in 2018. With better tools like NOAA’s GOES-17 in our atmosphere, humanity may be better prepared for impending extreme weather events, and scientists can work towards forecasting what’s coming on the horizon with greater efficacy.